At least I'm getting around to blogging on Tuesdays. 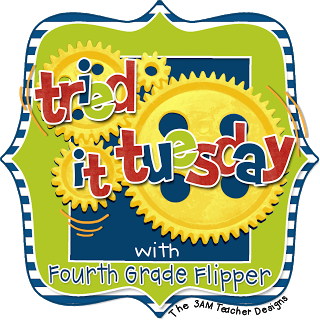 For this installment of Tried it Tuesday, I'm linking up once again with the fabulous Holly at Fourth Grade Flipper to share my take on Science Studies Weekly. At our school we get a portion of our students' school fee money to spend on classroom supplies that take learning "above and beyond." Therefore, you can buy classroom magazines, bare books, or anything else that would be "consumable" that takes learning to another level. Each year, I always order classroom magazines. This year our science teaching partner convinced us to try Science Studies Weekly (there is also a Social Studies Weekly). These "newspapers" align to state science standards and feature various articles relating to each standard. There are 28 total editions - enough for "weekly" reading if you choose to use them! Click the link for a list of some possible fifth grade topics. On our team, we've found that Science Weekly is a great way to incorporate some integration between Language Arts and Science. Students are learning science content while using nonfiction text features and strategies to help with their reading. There is also a quick quiz to accompany each week that my partner loves to use to check for comprehension and understanding of the material. The students really enjoy them and there is usually a crossword puzzle or brainteaser in each addition - who doesn't like the crossword? As a teacher, I do like the exposure to science reading for my students. I tend to do a lot of Social Studies type readings for nonfiction since I'm the Language Arts & Social Studies teacher - so I like that my students can see me reading "science stuff." My teaching partner loved that the weeks came in three HUGE shipments so she could sort the issues by what's she was currently teaching. Thus, you don't have to read them in precise order. My honest opinion? I'm not sure I'm as in LOVE with this text as my teaching partner, but it has really forced our students into reading nonfiction texts on a weekly basis. However, next year I think I'm going back to purchasing the magazine Super Science. Although, all the articles do not always align with her state science standards, the reading material is a little more "meaty" for the money! If you're looking to incorporate more nonfiction, check out Studies Weekly. They have subscriptions available for K - 6th grade in Science, Social Studies, and Math. Just find your state to make sure your issues align with your content standards! Do you subscribe to any publications? What are your favorites? I think we might have looked at this when we were deciding on Science and Social Studies series....or maybe someone brought it to the meeting that does subscribe. I can't remember. The Super Science looks good! I will definitely have to check these both out! We don't subscribe to any subscriptions but use the NY Conservation magazine that are sent free of charge. I would love to have something like this and will have to look into it! Thanks for another fabulous idea, Amanda! I cherish this article and astounding data get from this connection and paper administrations giving by expert scholars who compose http://www.essaydragons.com/write-my-essay the unadulterated exposition for us. We verify understudies get great paper. The twenty first century is regarded as the era of development and information technology. The field of IT is not only an education in itself but is helping other information and sources of knowledge to reach the people throughout the world with the means of internet. Such press release writer and easy accessibility has proved a convenience in the way of learning. Thank you for this information Friv 2019 Kizi 2018 Friv4school 2018 but please understand that as a representative of the Council Friv 2018 Kizi 2018 Yepi 2018 I am not at liberty to comment Friv4school 2018 Friv 2018 Friv 2018 Friv 2018 on the data or the situation for an individual Member State. Five for Friday: Spring Break edition! Workshop Wednesday: Nonfiction Note Taking! Must Read Monday: Dog Lovers Edition! Tried it Wednesday: Totally Target!